Baltimore Janitorial Supply Co. (BJS) offers professional repair service you can count on. Baltimore Janitorial Supply technicians can repair any piece of janitorial equipment we sell, or if you purchased your unit from someone else. Our onsite repair teams will respond promptly, ensuring that your downtime is kept to a minimum. In some cases, we can service your equipment at your facility. Janitorial equipment maintenance & repair to buffers, sanders, walk behind scrubbers, ride-on auto scrubbers, vacuums, extractors, propane burnishers, back pack vaccums, battery operated sweepers, wet vacs, pressure washers, and more. We can provide you with an estimated cost of repairing your equipment. Warranty service is available on all major brands makes & models. Brands - Karcher, Windsor, Nilfik-advance, kent EuroClean, Tomcat, Tennant, Nobles, Viper, Power Flite, EDIC, Mytee, Century 400, Mercury, Clarke, Pacific, NSS, Pullman & Holt, Minuteman, Tornado, Saintaire, Oreck, Aztek, Pioneer Eclipse, NacCare, Hoover, Rubbermaid, Pro team, Mosquito, and many more! Please call for details. While participating in the BJS Maintenance Program Maintenance Program, you will receive the most comprehensive program available including lubrication service, basic maintenance and safety inspections. Our program is exclusively tailored to your schedule and performed at the proper intervals to insure maximum up time for your equipment. This program is available for many other types of janitorial equipment. No charge for travel time. Any needed repairs are noted in inspection report. You decide if you want the repairs made . 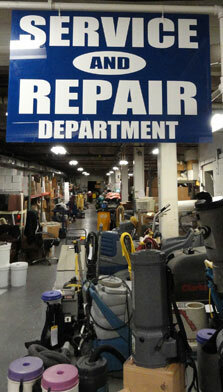 No pick-up/delivery charge if your equipment comes in to our shop for repairs. 10% discount on all replacement parts. Helps reduce costly down time. Reduces maintenance cost by repairing a small problem now that, if neglected, could turn into a major repair. Increases the optimum life of your equipment. Keeps your equipment at peak efficiency. Provides a maintenance program tailored to your schedule and specific needs. FREE Delivery on all orders $100 or more!! NO CHARGE on a Sales Representive to come to you Facility to perform a monthly cost analysis!! NO CHARGE on a Sales Representive to come to you Facility to perform a monthly or bi-weekly Inventory Management Program(IMP). You will never run out of toilet paper again! Mike Muth or Eric Bernstein for more details! Let us save you $$$ today!